I hope this message finds you well. I am so glad that you have remained faithful to the Cenacles of Life prayers and devotion. Prayer is so very important both to do good and oppose evil in the world. Prayer moves the Heart of the Lord, and especially when we approach Him through the intercession of His Blessed Mother and ours as well. The Cenacles of Life were begun in an effort to counter the many forms of immorality, like abortion, euthanasia and homosexuality, that have spread over our world, and especially our nation. The purpose of my message is to ask you to pray even more ardently to Our Lord and His Blessed Mother to protect our Catholic Church from legislation that would force her to pay for abortion, contraception and sterilization, all of which we know is totally against God’s Law. What this will ultimately mean is that we will lose our religious liberty, one of our most important and cherished rights (protected by the First Amendment in the Bill of Rights). It seems obvious, then, that many Catholics and peoples of other religious and moral convictions will be subject to horrific fines and even jail sentences for non-compliance with this immoral legislation. This will cause an enormous crisis of conscience for literally millions of Americans. What can we do? Prayer and penance can turn the tide! 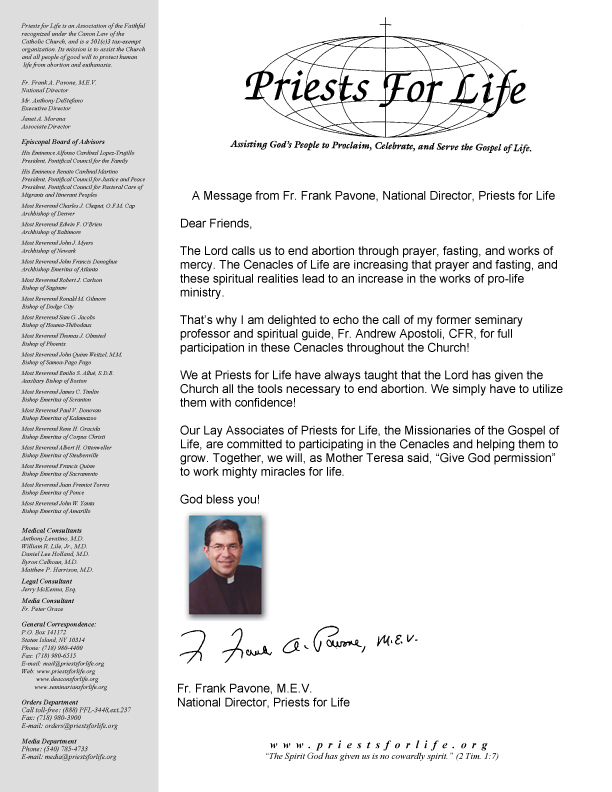 I am asking you to say the following prayers at your Cenacle of Life and then continue to use these prayers until the HHS Mandate is removed, which I believe can only come through Our Lady’s intercession.